Up until the age of 20, one of my favorite things to eat in the world was a tuna fish sandwich. That was my go-to lunch whether eating out or at home. There was a deli in my college town that put an absurd amount of tuna salad on a large soft roll and I would talk friends with cars into taking me to get one. At home, I mixed my albacore with plenty of celery, a little mayo, and a dollop of mustard. I piled it high on rye bread and topped it with tomatoes, pickles, lettuce. Then, four years after I stopped eating meat, I stopped eating fish. I contemplated having a special disclaimer for tuna fish sandwiches but ultimately decided that tuna fish is still, you know, fish. So I said goodbye to my beloved sandwich. Dried out rye bread smeared with too much mayonnaise and topped with a slice of Swiss cheese that has started to go crusty around the edges, a not-quite-red tomato, and a hunk of iceberg lettuce. Massive slices of oily greasy foccacia slathered with oily greasy sun-dried tomato hummus on one half and oily greasy tapenade on the other, topped with oily greasy roasted vegetables. Very earnest whole wheat bread, smeared with cream cheese and topped with every vegetable under the sun including an entire garden’s worth of sprouts. At home, it’s better. Grilled cheese when dunked into amazing tomato soup is nice. And I’m a total sucker for a tofu Bahn Mi. But really, I prefer a wrap or a salad. Or noodles. Or really anything else. I’m just not a sandwich gal. This is not a sandwich. It’s a tartine. Verrrrrry different. French. Open faced. One piece of really good bread. Interesting and varied toppings. Think crostini or bruschetta but bigger pieces of bread. More like, um, a sandwich. I like these very much. They are terrific when you want to make something for lunch or dinner but don’t want to shop. They are also terrific if you have a soup or salad that you are excited about and you just wanted something yummy to round out your meal. Last week, I planned to make a salad that I was excited about and I had a new pan I was excited about and so tartines it was. 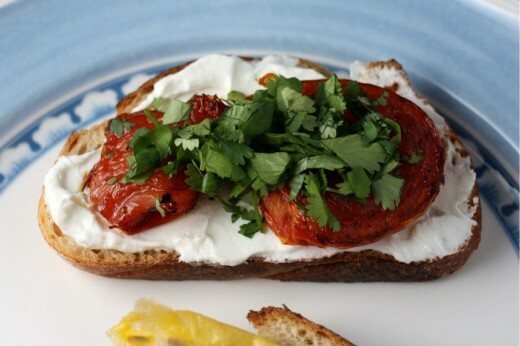 I made one with a labneh (kind of like a yogurt cheese), roasted tomato, and cilantro. 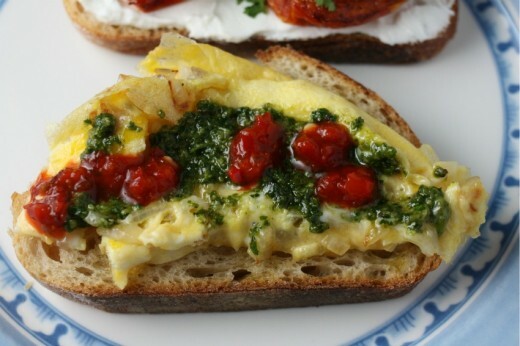 I made the other with a frittata made with shallots, cilantro pesto, harissa. Except I was out of harissa so I used sambal oelek (a chile sauce). Nothing super fancy but both were so much better than the sum of their parts. So how about that pan? One of the most common questions I get in classes is about what kind of pans I use. I am lucky to have a decent arsenal of high quality stainless steel pans (All-Clad), a few Le Crueset pots, a beautiful copper double boiler (that is too pretty to use), and a few other assorted others. I rarely use use non-stick pans. There are a few reasons for this. It is nearly impossible to get a good brown on an onion (or a steak for that matter – not that I would know) with a non-stick pan. Until recently, the coating on most non-stick pans would emit dangerous chemicals into your kitchen if left on high heat. And really, I am just in the habit of using stainless or cast-iron for most things. Except eggs. And pancakes. And grilled cheese sandwiches. There is no substitute for non-stick in those situations, in my opinion. 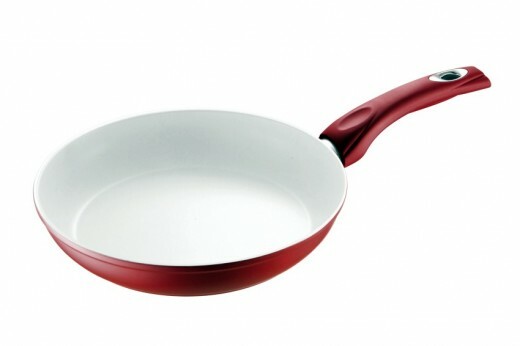 I have a huge All-Clad non-stick pan that I use for very large frittatas but it isn’t the best for smaller quantities. So when the Bialetti people offered to send me a new brightly colored perfectly sized pan, I jumped at the chance to say yes. What can I say, this is a great little pan. It is lightweight, has a handle that stays cool, a white bottom so you can easily see your food (why has no one else thought of this? ), and is super SUPER non-stick. I love it. And I know you would too. Want one? Just tell me about your favorite pan in your kitchen and what you like to make with it. I will randomly choose a winner on Tuesday, March 13th. This contest closes at noon (PDT) on that day. UPDATE: This contest is now closed. A winner has been chosen. The labneh needs to sit overnight in the refrigerator overnight, so plan accordingly. If you are going to go through the trouble of slow roasting tomatoes, you might as well do a larger batch. Lay the leftovers in layers drizzled with olive oil in the refrigerator. Place the yogurt, garlic, and a pinch of salt into a bowl and stir well. Line a sieve with cheese cloth and scrape the yogurt mixture into the sieve. Place a bowl under the sieve and put the whole thing in the refrigerator overnight. Preheat the oven to 300ºF. 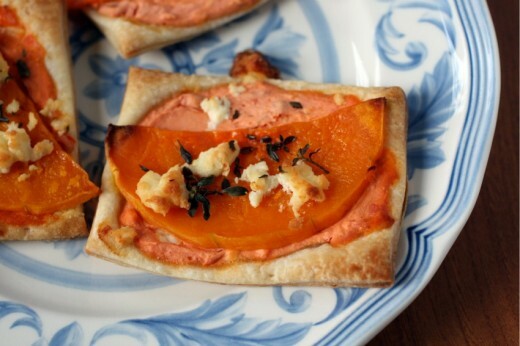 Place the tomato halves on a baking sheet and drizzle with olive oil. Sprinkle with a pinch of salt and a few grinds of pepper and roast until very soft and kind of shriveled, turning half way through the baking process, about 1 hour. Set aside. 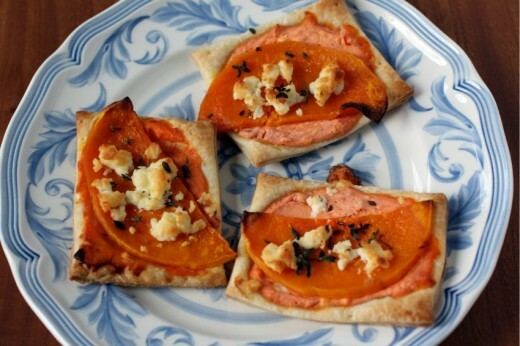 While the tomatoes are roasting, place the bread on another baking sheet. Drizzle with olive oil and bake until just a tiny bit crispy on top, but still soft, about 10 minutes. Set aside. 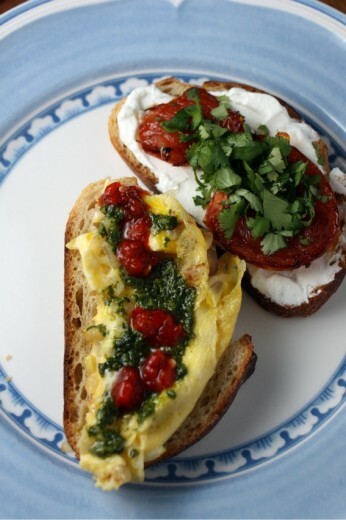 Smear a bit of the labneh on each slice of bread (you might have have some left over). Lay down two tomato halves and scatter cilantro leaves over the top. Season with salt and pepper to taste. Preheat oven to 325ºF. Place the cilantro and walnuts in a food processor. Sprinkle with a pinch of salt. Process until a coarse paste forms. Pour in the olive oil and pulse until you have a relative smooth pesto. Set aside. Place the bread on a baking sheet. Drizzle with a bit of olive oil and bake until just a tiny bit crispy on top, but still soft, about 10 minutes. Set aside. Place a non-stick pan over medium-low heat. Drizzle in a bit of olive oil and then add the shallots and a pinch of salt. Sauté until very soft and starting to brown, about 4 minutes. Pour in the eggs and swirl the pan around so that egg covers the surface of the pan. Keep lifting the edges of the eggs up so the uncooked top layer can get a chance at the heat. If you are very dextrous, you can flip the whole frittata over. If not, just make sure the top of the frittata is cooked, then remove from the heat. Slice the frittata into quarters. 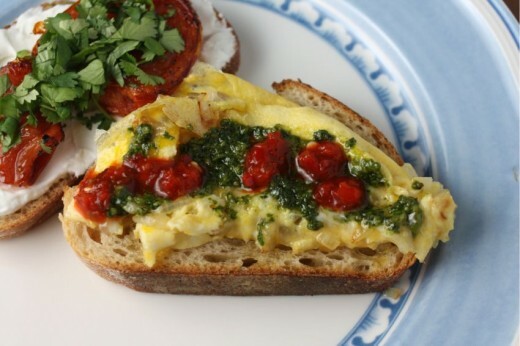 Lay a quarter on each slice of bread and spoon a bit of the cilantro pesto over top. 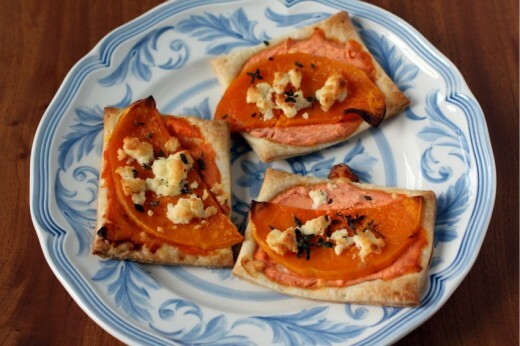 Add just about a teaspoon of chile sauce to each tartine. What Is In This Dip? I used to make a dip that I called The Dip. I made it often and I loved it. Simple, nutritious, easy to scale up, healthy. Tasty. I brought it to multiple yoga retreats. I made it for parties. People would ask, “Is this The Dip?”, and then they would use whatever scooping utensil that was handy to bring it to their mouths. Then I saw Lisa talk about another Dip. Similar to the one I made but with a few important differences. Lisa doesn’t usually post the actual recipes for the food she makes, she just talks clearly about the ingredients. So I bought the things I needed and made it to taste. And got totally hooked. Now this dip has become The Dip. I always do it to taste but because I think it is really extraordinary, I decided to actually measure out what I add to it so I could share. It is creamy (thank you silken tofu), a bit sweet (honey), a bit acidic (lime), and has a wonderful nose-clearing spice (wasabi). All this things mix together to make an intriguing dip that people will ask you about endlessly. 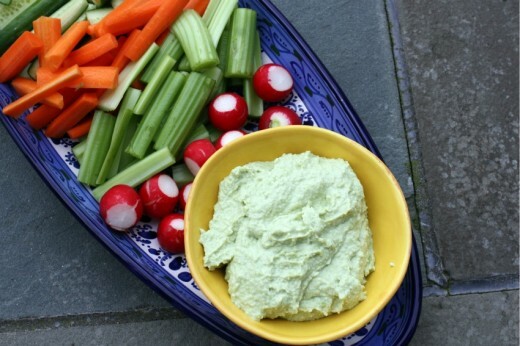 The veggies and dip tray is the thing I tend to hover around at big parties. This is partly so I don’t hover around the loaded potato skins tray but also because I really like veggies and dip. Even the super gross pre-made-full-of-chemicals-and-fat dip. So it is extra nice to be able to enjoy this dip knowing it is full of good stuff. Silken tofu is not usually refrigerated. It is in shelf stable packaging and can usually be found on the Asian food aisle. It comes in bricks that weigh about 12 ounces but you will not use the whole thing. 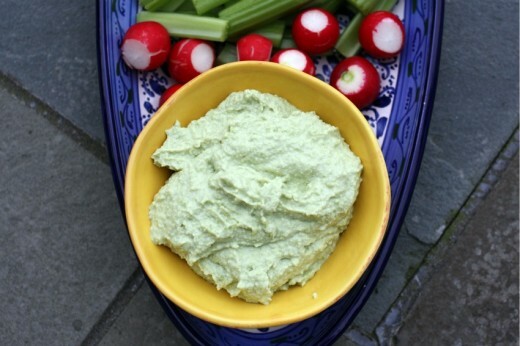 I like this dip with quite a lot of heat but if you want less, add just 1 tablespoon of wasabi paste. Bring a medium pot of water to a boil. Add a pinch of salt and then pour in the edamame. Cook for 3 minutes, drain and cool. Put the edamame in the bowl of a food processor fitted with the steel blade. Add the tofu, honey, wasabi paste, salt, and lime juice. Purée the mixture, stopping several times to scrape down the sides of the bowl, until it is more or less uniform. It might still be a bit chunky. With the machine running, pour in the olive oil. 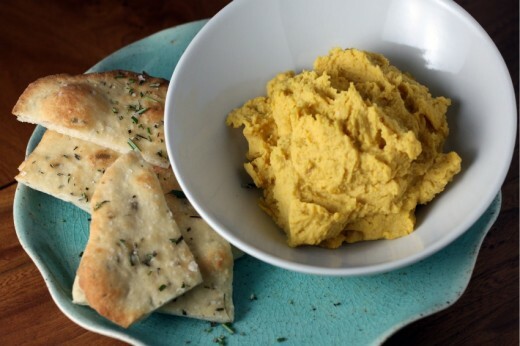 You might use more or less than 2 tablespoons depending on how loose you want the dip to be. Taste for seasoning and add more honey, salt, or wasabi to your liking. 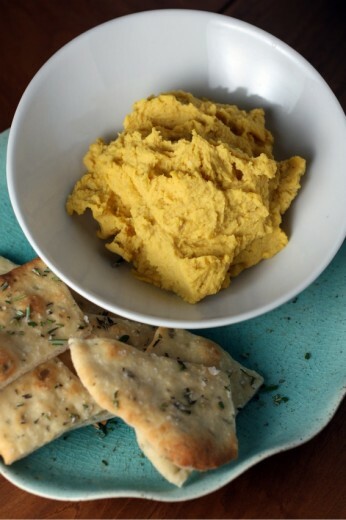 Serve with crudité and/or pita chips. Sometimes when I am at my cooking maximum, I somehow find the energy to add one more thing. I’m tapped, I’m tired, I’m starting to make stupid mistakes, and then I see something that sparks me – makes me perk up. I somehow find time to squeeze in this one more thing even though that bit of time could be of more value in other ways. And sometimes there is pay off, even though it may not seem that way at first. What am I talking about? Well, this has been quite a week for me and it’s not over yet. I taught classes Tuesday, Wednesday, and Thursday, and today I will be spending the entire day in the kitchen prepping lunch for tomorrow’s yoga retreat on Bainbridge Island. Everything has to be done today because I take a 7:55am ferry over there tomorrow. Normally, I spend a couple of days prepping but because of all the teaching, everything will be compressed into one day. Did I mention that my husband has been out of town? Yes, that too. I’m getting through by literally taking one day at a time. I can’t even think about the next project until I finish the current one. Nothing that can’t be used that very day gets made or done. Stay Focused Dana has been my mantra. So yesterday, precisely 40 minutes before I had to leave to pick up my children, precisely 2 hours before my students started knocking on my door, with precisely 57 different dishes in the sink or scattered around the counter, I decided to make Spice Crispies. The recipe caught my eye as I was making my favorite Chex Mix and suddenly, I was overtaken with the urge to create yet more dirty dishes and food. Fast as lightning, I preheated the oven, gathered ingredients, poured, sautéed, stirred, scraped, baked, washed, wiped, and as I was cursing myself because now I was even more behind than I had been before, a most amazing smell started wafting from my oven. I pulled the tray out, whisked it off to the dining room for a quick photo in the fading light, and took a taste. Weird. Interesting. Not sure. Waste of time? Maybe. And then off to finish out my evening, the Spice Crispies all but forgotten. After the class and after the clean-up was over, I remembered that I had stashed the tray in our study and a miraculous thing happened while they cooled completely and set up. These little clusters of cereal and spice had become something totally addictive and truly tasty. Even the raisins, which had become hard little nuggets, kind of like what happens to them in oatmeal raisin cookies, had their own unique appeal. I have a feeling that I am going to get a lot of questions about this little snack mix this weekend – it is intriguing. I wish I had the time to come up with beautiful metaphors describing the unusual yet delicious flavors in this snack, but I have a task list a mile long for today. Just trust me when I say that I really should be doing 100 other things rather than writing this post and yet, here I am doing just that. Have a great weekend. If you want to keep the raisins from getting totally crunchy, I imagine you could add them half way through the baking time. 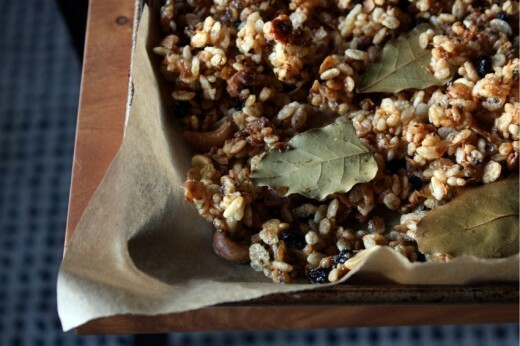 Preheat the oven to 325ºF and line a baking sheet with parchment paper. 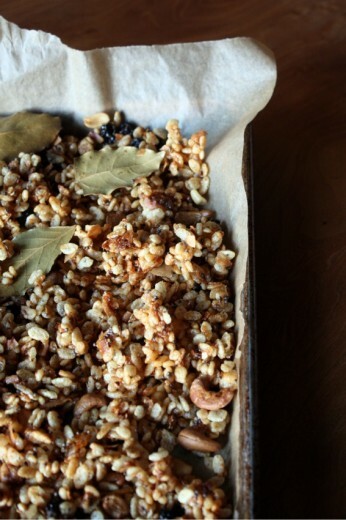 In a large bowl, toss the rice cereal with the cashews, peanuts, coconut flakes, and raisins. In a small saucepan, heat the oil until shimmering. Add the mustard seeds and cook over moderately high heat until they begin to pop, about 1 minute. Add the fennel and cumin seeds, crushed red pepper, and bay leaves and toast, stirring, until fragrant, about 1 minutes. Add the corn syrup, lemon juice, and salt and bring to a boil. 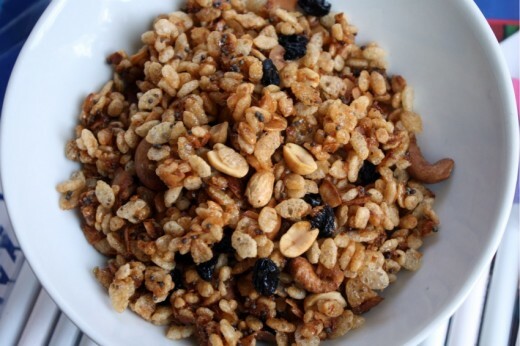 Drizzle the hot syrup over the cereal over the cereal and nuts and toss with a spoon until evenly coated. 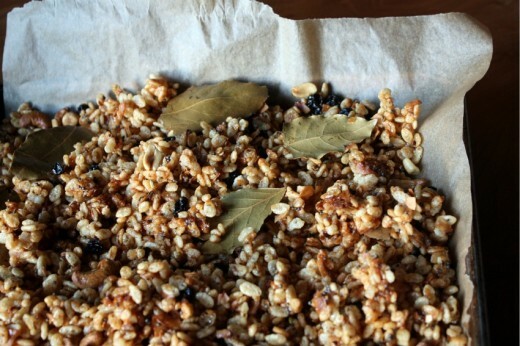 Spread the mixture on the baking sheet and bake for 25 minutes, stirring once or twice, until the nuts are golden. Let cool; discard the bay leaves.